The European financial mechanism known as INSTEX (Instrument in Support of Trade Exchanges) is aimed at facilitating trade with Iran by circumventing sanctions reimposed by the United States after it pulled out of the 2015 nuclear deal last year. After months of delay, the payment system was finally registered jointly by France, Germany and Britain in late January, but its activation is pending the operational details and the establishment of an equivalent entity in Iran, according to Financial Tribune. "The mechanism corresponding with INSTEX was launched in Iran last week and now Europeans have no excuse for [refusing to] fulfill their commitments and begin the operation [of the instrument]," Foreign Minister Mohammed Javad Zarif said on Sunday, ISNA reported. The instrument is aimed at enabling legitimate trade between Iran and the European Union in the first phase before expanding to cover third parties as well. Given the small level of trade between Iran and the EU, the second phase of the project that would link the country to the world is of greater importance for Tehran. Zarif voiced disappointment with Europe's slow progress with the plans, urging their leaders to step up their efforts. "They are far behind [with their plans] and should not think that Iran would wait for them," he said, stressing that INSTEX is only a preliminary measure for safeguarding Iran's interest under the nuclear deal. He pointed out that Iran has launched similar payment channels with a number of other countries, which are successfully operating at present. "I don't know how much time Europeans need for a preliminary mechanism," he complained. Iran is conducting trade with countries such as Iraq, Turkey and India through such non-dollar systems. Zarif made the remarks on the sidelines of a ceremony for launching the Foreign Ministry's economic diplomacy website. According to Gholamreza Ansari, Zarif's deputy for economic diplomacy, the website will have two sections and the first on foreign markets was launched Sunday. The second section, which is planned to introduce the economic capacities of Iran mainly in English, is yet to become operational. "We hope that manufacturers and businesspeople will be able to find their markets more easily, thanks to the massive efforts mounted for the launch of this website," Ansari said during the ceremony. Zarif was also asked about Iran's measures in response to the US recent move to designate Iran's Islamic Revolution Guards Corps a foreign terrorist organization. The White House announced the decision last Monday on its website, marking the first time that the US has ever named a part of another government as an FTO. The designation is to take effect on Monday when Zarif is to send messages to foreign ministers of other countries. "In the letters, we have emphasized the importance of other countries' position toward the decision and explained the dangerous consequences of the United States' unprecedented measure," he said. Iran's Supreme National Security Council has already placed the US Central Command (CENTCOM), which is responsible for the Middle East and Central Asia, on the list of terrorist groups in a reciprocal move, regarding the US regime as a state sponsor of terrorism. 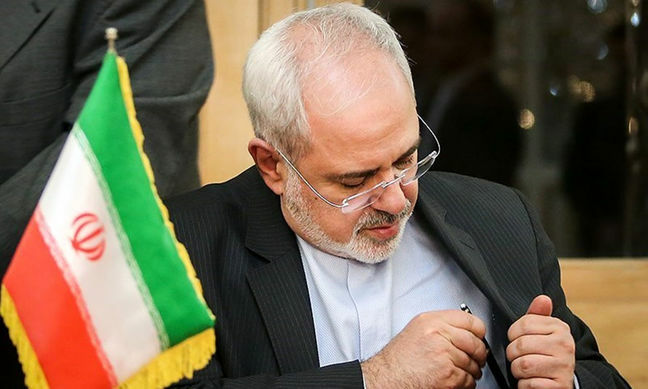 "I also wrote a letter to United Nations Secretary-General [Antonio Guterres] and the UN Security Council, highlighting the illegality of the US move, the wrong American policies in the region and their consequences," Zarif told reporters. According to Zarif, the Foreign Ministry is in consultation with parliament to envision plans in this regard.